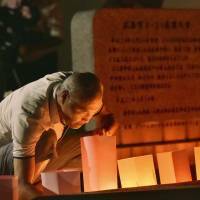 HIROSHIMA - People in the city of Hiroshima on Monday marked the fourth anniversary of landslides that killed 77 people with pledges to prevent similar disasters from recurring. This year, the anniversary arrived about a month after devastating flooding and landslides claimed at least 226 lives in western Japan, with 113 in Hiroshima Prefecture alone. 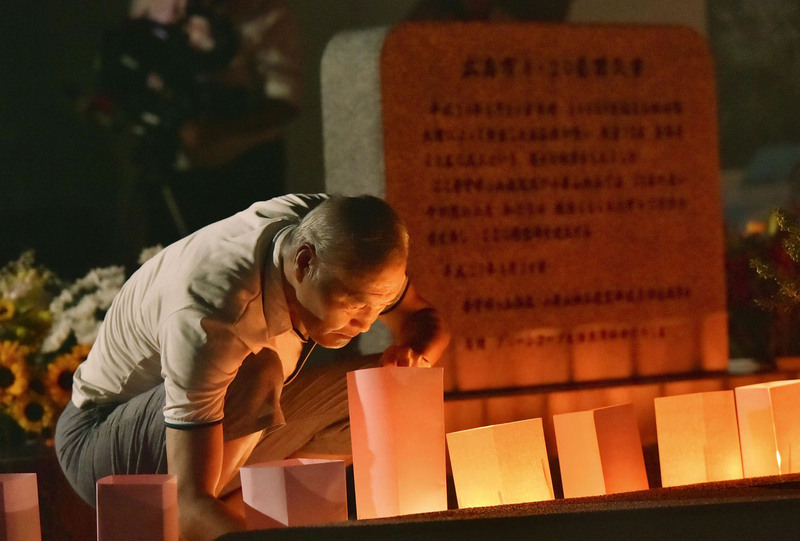 Memorial ceremonies were held in places including Asakita and Asaminami wards, which were heavily damaged by the August 2014 mudslides. 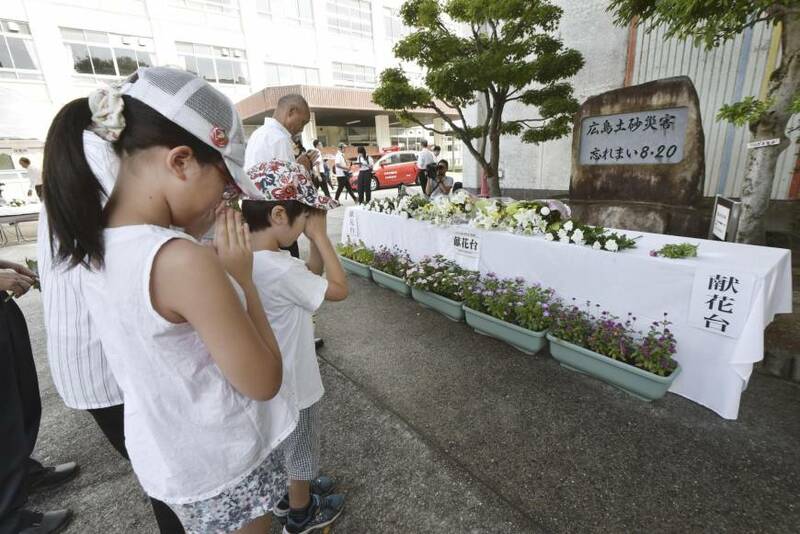 At an elementary school in Asaminami, about 100 people observed a moment of silence in a ceremony attended by Hiroshima Mayor Kazumi Matsui. Representing the families, Riko Kihara, 18, who lost her father and older sister, offered flowers at the memorial service. “I just remember that I had a terrifying experience four years ago. Please do not forget the landslides,” she told reporters. 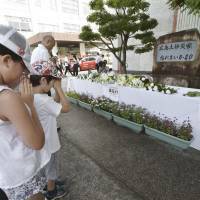 At a different site in the ward, Junji Wakamatsu, 55, and his wife, Naomi, 56, placed a bouquet at a cenotaph commemorating the death of their daughter Minami Yuasa at 28. Naomi said she still has dreams of her daughter returning home. “It is so calm here that I feel as if the landslides did not happen. But I am reminded of (the danger of) natural threats,” she added. Hideharu Hatahori, head of a facility residents set up afterward to raise disaster awareness, said last month’s devastating downpours reminded him of the need to keep talking about such experiences. “For people to develop a sense of urgency, we have to work hard to tell them about our experiences,” said Hatahori, 61, whose home was severely damaged by the mudslides. On Aug. 20, 2014, a series of landslides destroyed, washed away or damaged about 400 houses that were close to mountains. In Asaminami, where Hatahori’s facility is situated, about 70 people died. But the area was spared serious consequences from last month’s rain disaster because many residents evacuated early. Hatahori said many residents in the area may have had a greater sense of urgency than before. “I want people to become more aware so that they can make the right decisions” when it counts, he said. On Monday, Matsui visited disaster-hit areas where barriers are being constructed to defend against landslides and soil erosion. “It is necessary to utilize the know-how (for these barriers) to also restore areas hit by the torrential rain in July,” Matsui said. In last month’s rain disaster, hundreds died in areas that were already designated as potential danger zones. Experts pointed out the challenges of evacuating and alerting residents in such areas. To do a better job, the Hiroshima Prefectural Government plans to survey residents on when they decided to evacuate during July’s torrential rains and what prompted them to do so.